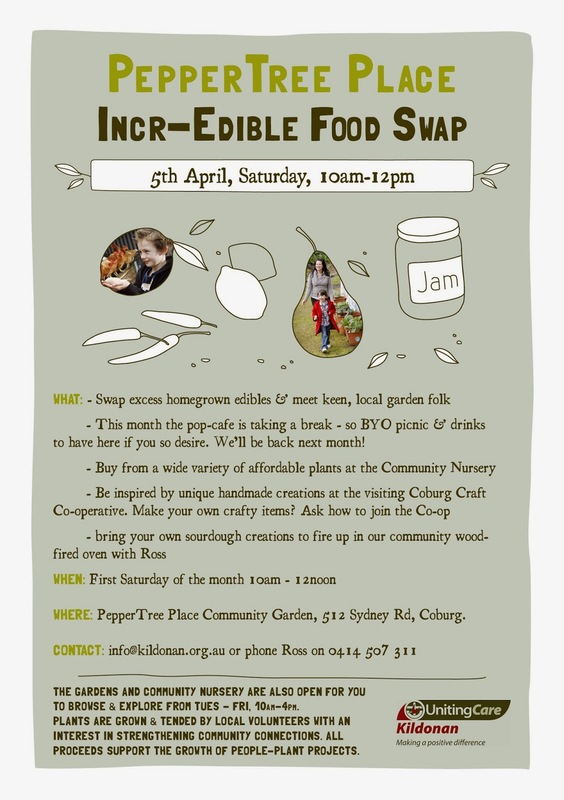 PepperTree Place Incr-Edible Coburg Food Swap is on this Saturday, 10am-12pm - bring your end of summer season excess produce and swap it for something you haven't been able to grow or have much of. From 11am there will be discussion and much ado about OLIVES!!! It is nearly olive harvest! The olives on our trees are ripening fast. It is time to decide which processing method to use this season! We have tried several methods and we know some of the regular swappers have local expertise on this subject. Take the opportunity at this weekend's Food Swap to share skills and knowledge in processing olives. If anyone else would like to bring olives from their tree, that will be great. We will have a processing demo and discuss the various methods. There will be olives to take home to process. The woodfired oven area has received a fabulous make over recently - so come and check it out and bring your doughy creations to be baked off from 10.30am. This weekend our Pop-Up cafe won't be popping up so we encourage you to bring your own picnic and drinks if you like to have here. Its taking a small break and will pop back up again the following month.